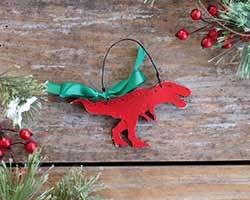 Dinosaur Ornaments - Perfect for paleontologists of all ages, we have dinosaur Christmas ornaments of all kinds and colors. Many come with personalization! 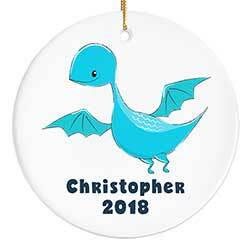 Features a blue flying dinosaur, and your choice of name and year. Great children's ornament! 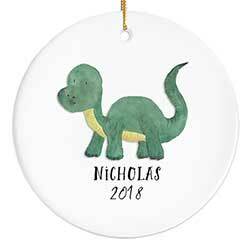 Features a watercolor image of a green brontosaurus dinosaur, and your choice of name and/or date. Great for a children's Christmas ornament! 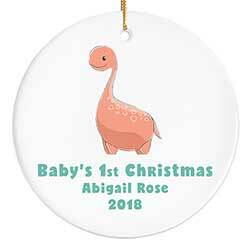 Features a cute dinosaur in an apricot orange color, and your choice of name and date or year. 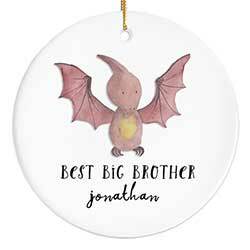 Great children's ornament! 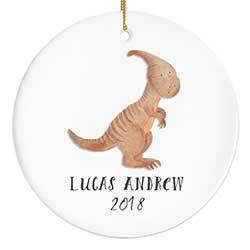 Features a watercolor image of a brown parasaurolophus herbivorous dinosaur, and your choice of name and/or date. Great for a children's Christmas ornament! Features a watercolor image of a flying pterodactyl dinosaur, and your choice of name and/or date. Great for a children's Christmas ornament! Features a cute purple dinosaur, and your choice of name and date or year. Great children's ornament! 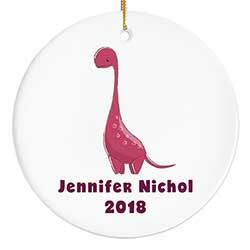 Features a cute red dinosaur, and your choice of name and date or year. Great children's ornament! 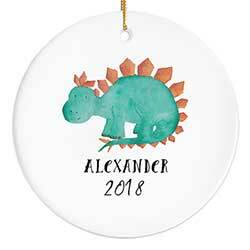 Features a watercolor image of a green stegosaurus dinosaur, and your choice of name and/or date. Great for a children's Christmas ornament! 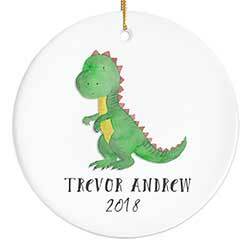 Features a watercolor image of a cute tyrannosaurus rex dinosaur, and your choice of name and/or date. Great for a children's Christmas ornament! 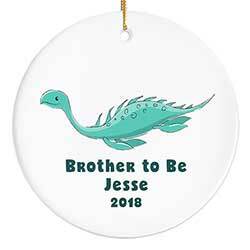 Features a teal dinosaur, and your choice of custom wording on the front - shown is "brother to be," but you select your text! 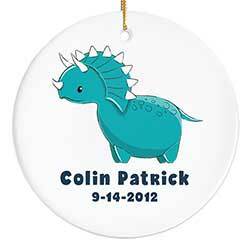 Features a cute teal triceratops dinosaur, and your choice of name and date or year. 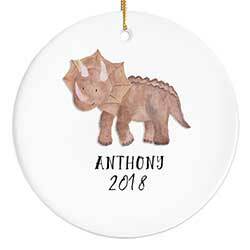 Perfect for any paleontologist, young or old, this triceratops ornament is hand painted in your choice of color, and comes with free personalization. Features a watercolor image of a brown triceratops dinosaur, and your choice of name and/or date. Great for a children's Christmas ornament!